When it was erected in 1918, the Lynchburg Glass Works was considered a state-of-the-art facility. It was built with the intention of producing various types of bottles and windowpanes; however, a changing market soon allowed the company to expand its line of wares. The Lynchburg manufacturer’s markings can be found on a variety of collectable glassware, including electrical insulators, fruit jars, medicine bottles, and soda-pop bottles such as Coca Cola and Chero Cola. Though the plant was well equipped and ideally located for rapid rail service, financial success eluded the company during its first five years of operation. To what extent mismanagement, competition, or quality issues hurt the bottom line during that period is unknown. This story begins in 1922–1923, when the glass works was making an attempt to add to its capabilities and attract new customers. Early in 1923, the Lynchburg Glass Works fell on hard times. President N. D. Eller felt that the company could do much better and sought to improve its financial status. The 1922 closure of the Brookfield Glass Company in New York presented Lynchburg with an opportunity to fill a major market niche. Eller began exploring the possibility of manufacturing glass telephone, telegraph, and power insulators. Justin Stoudt became interested in insulators ten years ago and has collected close to 1000 so far. 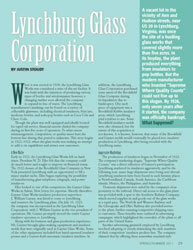 At the same time, Stoudt has been actively researching the history and products of the Lynchburg Glass Corporation. He recently purchased what he considers to be the centerpiece of his collection: original Lynchburg Glass Corporation correspondence and documents. The author would like to thank Mr. John Whitmore for sharing his knowledge and love of Lynchburg Glass Corporation, and also for being a great friend and mentor.